Need to organize a service learning project? Do you want your students to get involved in their community? This packet will give you everything you need! This 4-page guide will give your students the complete step-by-step walkthrough of their project. 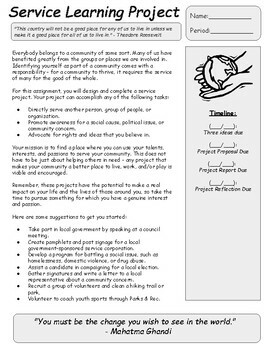 The first page contains a short article with a project introduction, a list of project ideas, and the rationale behind service learning and community involvement as a whole. 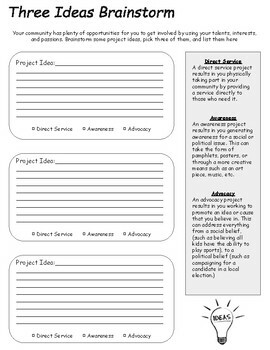 The second page contains a brainstorm activity, which teaches students about the different forms of service and allows them to lay out some project ideas in depth. 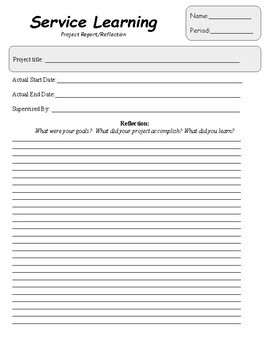 The third page contains a project planning guide, which will lead your students through the entire planning process. 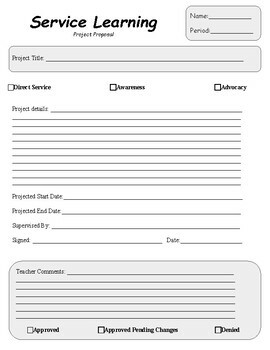 It also includes a sign-off sheet, which must be approved by the teacher before the project begins. The last page contains a space for reflection essay, in which students are asked to reflect on their project and write about it. I've used this project in multiple classes, and I hope that it serves you well!